Blog of the Good Counsel Network, a Catholic pro-life group dedicated to fighting abortion through serving those in crisis pregnancies in the way in which Mary served Christ during His earthly life. This blog gives our advisors, fundraisers, office staff and volunteers a place to tell you about our daily battles in the service of Jesus, Mary and Life. 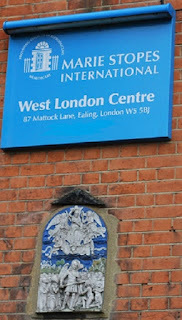 Photos show: marie stopes Ealing, signboard above the plaque of St Michael the Archangel. And a clearer image of the plaque alone. 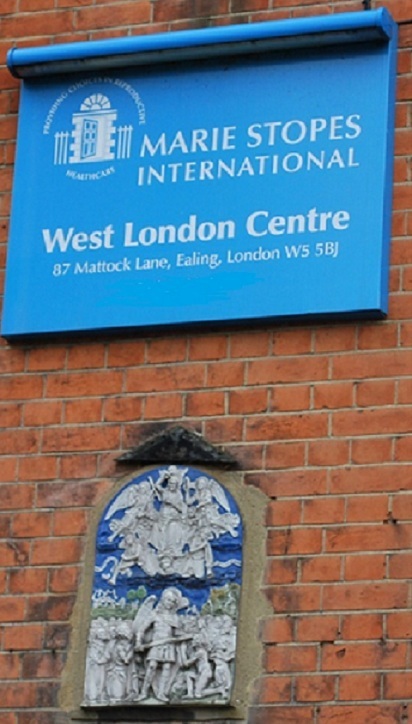 Like many London abortuaries (Buckhurst Hill, Brixton and Twickenham to name a few) and others worldwide, the building which houses Ealing abortuary has a profoundly Christian and Pro-Life history. 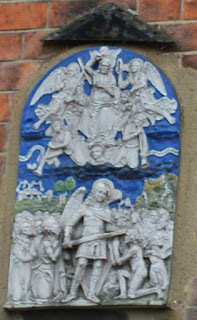 This is indicated for the casual bypasser by the image of Christ and St Michael the Archangel which the building bears on the front wall, just under the marie stopes sign. Please join us in prayer for the end of abortion and specifically for the closing of the Ealing abortuary and read on here to learn about the history of this place. Holy Michael the Archangel, defend us in the day of battle, be our safeguard against the wickedness and snares of the devil. May God rebuke him, we humbly pray and do thou, O prince of the heavenly host, by the power of God thrust down to hell Satan, and all the wicked spirits who wander through the world seeking the ruin of souls, Amen. Please donate to Good Counsel so that we can continue to help the Mothers, who change their minds on the very doorstep of this abortion centre. What would you say if someone told you that in the heart of London there is a Marie Stopes abortion clinic in the former Chapel House? How would you feel knowing that thousands of babies have died so far in the house where not so long ago a woman described as a saint lived and ran a Christian Home of Spiritual Healing? How would you feel, you Christian, knowing that the place Jesus choose for healing was turned into a mass destruction facility? Are you not appalled yet by that sacrilege? Would you finally do something? This is a shocking and fascinating story about a real house, a real person and a real battle between good and evil. The present-form house – named ‘Morley’ – was built in 1902 for Mr Herbert Grice from the designs of Mr William A. Pite F.R.I.B.A. It was constructed just next to Walpole Family’s Old Chapel (map from 1894 ) that still stands today at 86 Mattock Lane is a Grade II listed building dating to early 19th century. Later Morley House (today’s Marie Stopes abortion clinic) became a part of the Chapel House complex. DOROTHY KERIN: God’s miracle. She was born on 28th of November 1889, in Greater London. At the age of 22 this fragile, Anglo-Catholic girl, following years of illness principally from tubercular peritonitis, diabetes and its complications, and after two weeks in a state of near coma and after eight minutes of clinical death, she was apparently miraculously and instantaneously raised to life. She reported powerful experience, in which (she said) she met Jesus Christ, who gave her a commission, to return to this world and perform an important work for Him. In this vision she was brought back to life ‘to heal the sick, comfort the sorrowing and give faith to the faithless’. The events of her subsequent life, and the mission that she so devotedly performed, strongly support the veracity of that account, which she put in writing at least twice (in her books: The Living Touch and Fulfilling: A Sequel to The Living Touch ) and to which she often referred in informal conversation and in public talks given in many locations. Her constant motto was: “Where God guides, God provides”. She also stresses the need for implicit obedience. ‘Through the long years of my life, through the grace of God, I have come to know that obedience is the golden key which unlocks the door to every spiritual experience, and I humbly believe it is the most important thing in the life of all Christians . . . and we shall find that when we have learned to obey in small things, the Lord will ask more intimate and costly obedience from us, and we shall delight in the glory of obedience which is better than sacrifice.’ In his funeral sermon, Right Reverend Cuthbert Bardsley, Bishop of Coventry said of Dorothy: “Hers was a rare spirit. People like Dorothy Kerin are not born every day. She seemed at times – indeed, I think frequently – to be a Light, burning with an inner glow, diffusing a strange radiance of peace and charity. Dorothy was one of those people – and they are rare – who combine a mystical knowledge of God with a strong down-to-earth out-going service to humanity. She was – and I use the word with some trepidation – a holy woman. A person of very deep spirituality, who moved through this world as a burning, shining Light.” Dorothy Kerin was supported in her work by the Archbishop of Canterbury, the Orthodox Archbishop of Corinth, the Bishop of London, the Bishop of Coventry and many others. By 1957 her work became internationally known – she travelled to Sweden, Switzerland, France, USA and Ireland. On February 18th 1962 there was a service of Thanksgiving at St. Martin-in-the-Fields to commemorate the Golden Jubilee of her recovery and in October a big Thanksgiving service in St. Paul’s Cathedral. She died in Burrswood on 26th of January 1963. A Memorial Service took place at St Martin-in-the-Fields, London and the address was given by the Bishop of Coventry. 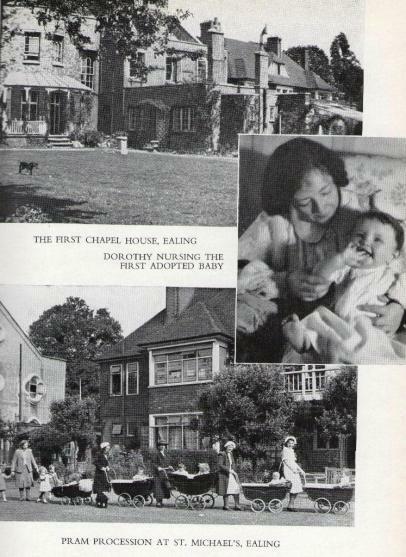 DOROTHY KERIN: God’s miracle worker – Chapel House, Ealing (1929-1948) In 1929 more and more people were coming for Dorothy’s help and the need for a Centre for them started to be pressing. She rented St. Raphael’s, a ten-roomed house at Ealing, and opened it as a Home of Spiritual Healing. Dedicated by Bishop Boutflower, the tiny chapel at the top of the house could only hold five or six people and it was soon apparent that the promises were quite inadequate to cope with all those who wished to be ministered to. She used to walk her dog in nearby Walpole Park every evening, and it was on one of these outings that she saw a somewhat derelict but lovely old house for sale. It was originally on the estate of Sir Horace Walpole and his family, and the oldest part of it had been their private chapel, hence its name, ‘Chapel House’. The mansion itself was then a museum and the grounds a public park. Dorothy and Bruno walked around the outside of Chapel House and peeped in at the windows. She heard a voice say, ‘Buy it for Me’ and was convinced that this house was meant for her work. In her book “Fulfilling: A Sequel to The Living Touch” she wrote about the house: “I was sure that if Chapel House was God’s will (as I most devoutly believed it to be) then He would provide.” Dorothy has always ‘seen’ the gracious house on the other side of the Chapel House as belonging (now Marie Stopes abortion clinic), and in 1937 , this too was bought. Her sister writes : “She moved into St. Michael’s with our mother, planning to run it for patients who needed no nursing”. Dorothy Kerin loved Chapel House dearly but needed to leave it in 1948 when she moved to Burrswood – a mansion in the Kent countryside, quite run down from being requisitioned by the military during the war. She set about developing it as a Christian home of healing. “St. Michael’s was bought by a doctor for a Maternity Home (now an abortion clinic), and a friend offered to buy St. Gabriel’s and run it for the elderly patients. (…) The purchase was arranged, but before contracts could be exchanged, the Middlesex County Council stepped in with an offer for the whole property. When Dorothy refused this owing to its small amount, they countered with a threat of a Compulsory Purchase order. After many complications Dorothy finally agreed to sell to the Council on the condition that they made a quick settlement.” Marie Stopes International bought St. Michael’s house in 1993. What would DOROTHY KERIN think about her beloved St Michael’s House (Chapel House) being turned into an abortion clinic?! Dorothy Kerin loved children. "Dogs and children could do no wrong in her sight (…) she was literally festooned with children” said her sister Evelyn. “In the midst of turmoil of war and coping with the running of this large house full of sick people under extremely adverse conditions, when one felt that she could carry no more, my sister entered into one of the most momentous undertakings of her life. She legally adopted first one baby girl, and then eight other orphaned babies. She had always been devoted to children, but this seemed a large project even for Dorothy Kerin. She had been told by our Lord, she said, to take nine infants and nurse them for Him.” “She was praying in the Chapel (Chapel House, Ealing) one night, troubled by a very difficult problem. She became aware of the presence of Our Lord. 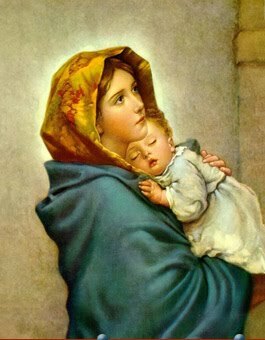 He placed an infant in her arms, saying ‘Nurse this child for Me.’ Clasping the baby to her, she felt its weight was so heavy that she could scarcely hold it. The vision passed, and she realized this was something God held for the future. (…) Babies that Our Lord had revealed were soon to come to her. In looking objectively at the adoption of these children, two major factors of her complete integrity stand out firm and clear. The first is her poverty at the time. In her own words, speaking of those early days in Ealing:’ There were financial and other difficulties, and though God was pouring His blessing upon us, we were not left in any doubt as to the pover of evil. We were beset with every kind of difficulty and frustration at times, and learnt that it was not easy, or alas, attractive to do some of the hard things we were called upon to face to do. But always once had the assurance that ‘My Grace is sufficient’.” All her 9 children but one (Anne) are still alive. DOROTHY KERIN: final Healing Home – Burrswood (1948 – today) In Burrswood Dorothy established a Christian healing hospital. She believed that professional nursing care was important, given that a 100% immediate miraculous recovery rate just doesn’t happen, and none would claim it. Dorothy recognized that healing comes in many ways, and many need good, loving medical care as well as prayer – without in any way losing the cutting edge of faith. In her letter to the Burrswood Fellowship, 1954, Dorothy wrote, ‘Surely the most exciting and wonderful adventure in life is when we put our hand into God’s hand and trust Him utterly, for indeed His ways are not our ways, and His ways are best.’ Dorothy Kerin died in 1963. The Dorothy Kerin Trust was registered and operates today with the following mission: 1) to deliver high quality interdisciplinary care to patients with a range of conditions through the marriage of medicine and Christian ministry, 2) to promote the knowledge and provision of such care by encouragement, example, action and support, 3) to extend Christian hospitality to all who come to Burrswood, 4) to teach, preach and heal in the name of Jesus Christ, 5) to act as a resource to others wishing to develop the Christian healing ministry. The following are the honourable patrons: His Grace the Archbishop of Canterbury, Dr Rowan Williams; General Lord Dannatt GCB CBE MC; Professor the Lord McColl CBE; Baroness Emerton DBE DL; Vicountess Brentford OBE; Bishop John Perry. She was a precursor of healing ministry strongly believing that “in seeking to heal the body we must treat body and soul together”. 20 years after her death a new post of Archbishops’ Adviser on the Christian Healing Ministry was created in the Church of England. In 2000 the Church of England issued its first report in 40 years on the ministry of healing. Also in the Catholic Church, Cardinal Ratzinger, the prefect of the Congregation for the Doctrine of the Faith (now Pope Benedict XVI) in 2000 issued an “Instruction on prayers for healing”. At present, Archbishop of Canterbury, Dr Rowan Williams is a Patron of Burrswood, and the work of Burrswood is strongly supported by the Church of England; as it is by the many healthcare professionals who refer their patients to it. DOROTHY KERIN and prayer vigils outside her Chapel House It’s Saturday morning. Every week, a group of faithful Helpers of God’s Precious Infants prays outside the Marie Stopes Ealing abortion clinic, 87 Mattock Lane. Every week those committed people offer help to women in despair and pray to God for His mercy and help to end abortion. 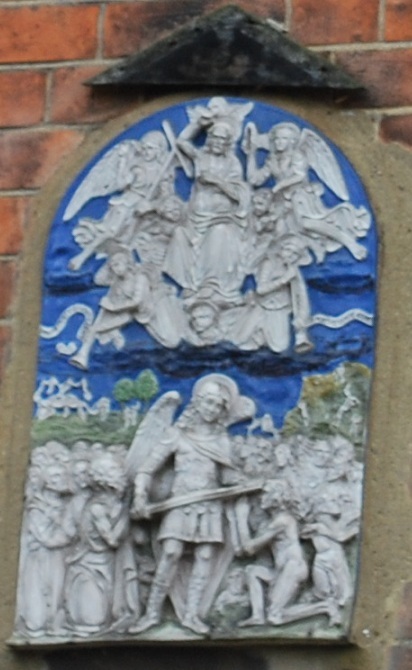 And every week they look at the relief of Archangel Michael embedded on the front wall of the house, just under the Marie Stopes, 87 Mattock Lane logo. And they are mesmerized and wonder: does anyone remember what was in that house before? The passers-by seem to know nothing … Throughout her whole life, Dorothy Kerin, the servant of the Crucified, asked no questions and formed no argument – her response was entire obedience and love: “By the bruising of my whole life, strengthen me with simplicity for every wounded soul, and let my prayers be as balm for the wounds of Thy children, that they may be healed.” I am certain she would be happy seeing us there – obedient and prayerful as she used to say: ‘Nothing equals the abandonment of the will to Our Lord. Nothing is more intimate to a person than his or her will, tastes, likes. To love and to look for those things in Our Lord is to find what is most profound in Him, His Heart, and it is to meet Him in a most sure and profitable way. Most sure because nothing should be able to shake us at any moment from that true communion that God gives us in his action on us through everything, every person, every event. Most profitable, equally – because everything in our life becomes material for supernatural growth, and because a thousand unpleasant realities are transfigured at the touch of God’s always very loving hand. "Dorothy once said to a friend, as they looked at a fragile flower while they were walking through the Burrswood garden, “I love all growing things, don’t you?” That tells us everything. I suggest that there is no coincidence in the location of this house on her site. As Dorothy taught, the powers of evil focus their attacks most intensely where God’s work is most powerfully being done. Or, in this case, where it has been done. The dark forces are seeking revenge for all the defeats they suffered earlier at this Home. Thus the enemy is forced to show his hand. That is my opinion." Please donate to Good Counsel so that we can continue to help the Mothers, who change their minds on the very doorstep of this abortion. Please Pray that The Good Counsel Network will continue to work and pray for the Greater Glory of God.